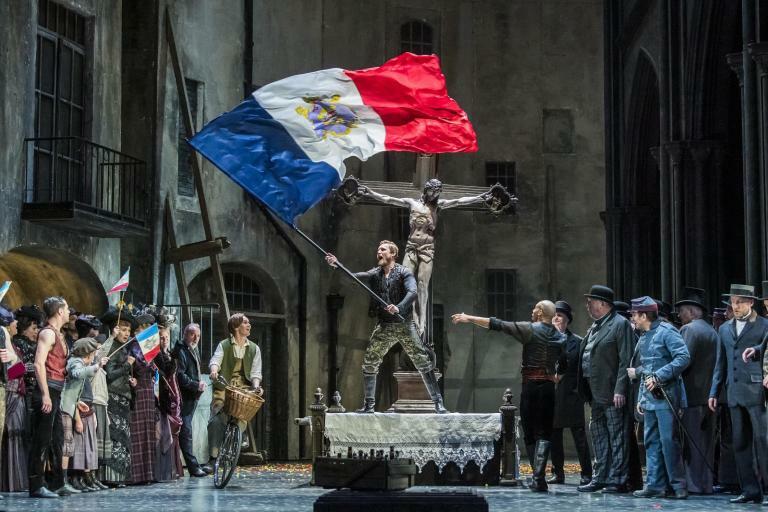 Verdi’s third opera has a particular association with the Italian people for it was written at a time when the country was still part of the Austro-Hungarian Empire and it was easy for audiences to associate their struggle for independence with that of the Hebrews from Biblical history. The inspiring choruses invoke the plight and indeed the hopes of Italians in the mid-nineteenth century. There is a particular irony in that the city of Naples lost much of its significance when the Italian Republic was formed losing out to the northern cities of Milan and Rome. Following the world premiere at La Scala Milan in 1842, it was six years until this opera was first staged in Naples on 22 March 1848 under the direction of Antonio Farelli. It attained immediate success, for the production was repeated 13 evenings, with its second staging on 15 November the same year, and became regularly performed although, following its 1861 production, Nabucco did not see another performance at the San Carlo until 1911 under Lepoldo Mugnone. Stagings in the 20th century have been intermittent and certainly a highlight was the appearance by Maria Callas as Abigaille on 7 December 1949 in a performance conducted by Vittorio Gui, which also cast Gino Bechi as Nabucco and Gino Sinimberghi as Zaccaria. In 1969 the company took their Nabucco production by Oliviero de Fabritiis on tour to Brazil. Since the 1960s, the San Carlo Theatre have mounted another seven productions and singers who have performed here have included Elena Suliotis, Gianni Raimondi, Giuseppe Taddei, Piero Cappuccilli, and Renato Bruson. The most recent production seen in 2016 was directed by Daniel Oren which lasted only two performances. This latest staging by Jean-Paul Scarpitta is only the second since the millennium. This production was conventional allowing the music and the singing to be given more precedence. Verdi’s opera was the first to make the composer into a major figure in the genre, producing a superb work using a biblical theme from Temistocle Solera’s libretto. Thankfully, unlike productions elsewhere, there was no attempt to draw parallels with current conflict in the Middle East. Prior to the premiere, there were changes in the conductor, with Nello Santi replaced by the young but experienced Ciampa, and late changes were made in the two main characters of Nabucco and Abigaille. The performance that I attended was the third showing of this production and used most of the principal singers who took part in its premiere three days previously. The Overture immediately allowed one to judge the superb acoustics of the theatre, one could hear musicians clearly, and from his brilliant work at the rostrum Francesco Ivan Ciampa’s outstanding gifts were obvious: his is a name we shall surely be hearing more of in years to come. The Overture was a marvellous assemblage of the themes which would be heard throughout, and the invocation by different soloists in the strings, woodwind and brass set the audience well for the evening, Ciampa allowing the narrative to be finely delineated. The sets were mostly determined by a series of backdrops against which images of nature were projected usually in greys and blacks and whites, and dark brown during the scenes with the Assyrian soldiers. In the opening scene, in which the ruined temple held centre-stage, there were no other scenery on stage all night. The costumes were traditional with the Hebrews attired in white robes, and the Assyrian soldiers in helmets and armoured garb in dark crimson. This opera is distinguished by tremendous choruses throughout, and the San Carlo Chorus revealed how magnificent in their world class singing from the very first opening scene. The Zaccaria of Rafal Siwek was magnificent also from his opening aria showing gravitas in his dark and murky bass, and throughout finely characterised, having a strong stage presence. The Ismaele taken by Marco Miglietta was not so impressive in his acting facilities, yet he proved a strong and reliable Italianate tenor throughout. The most outstanding singer however was the Abigaille of Susanna Branchini. In her big arias, especially the ‘Ben io t’invenni, o fatal scritto!’ Most markedly however the aria ‘O dell’ ambita gloria’ from Branchini drew parallels with the great Callas who sang here in 1949 under the baton of Vittorio Gui, her characterization grew in intensity throughout, and while sometimes one wished her to concentrate on other scenes, her portrayal of this immeasurably complex woman grew more formidable towards the dreadful climax. The colours and nuances in her voice were among the finest that I have heard for a long time. The costumes designed for her were of dark red robes, in the opening act, whilst in the later acts, she attired in light blue, until the final scene when she is in deathly black. The Nabucco of Giovanni Meoni was in total character with his role, and he is as good an actor as a singer, and one would like to hear more of him in the future. Again one must praise the chorus as fantastic, directed magnificently from the pit by the young Italian conductor. However recognition for the tremendous singing must go ultimately to the chorus director Gea Garatti Ansini in preparing the singers of the chorus for this opera. The effective contribution of the off-stage band were wholly apt. In the famous chorus ‘Va pensiero’, there was some magnificent accompaniment for the singers from the cello of Luca Signorini, from the flute of Bernard Labiausse, and also some wonderful playing from Giuseppe Cascone on trumpet and Gianluca Camilli’s solo trombone during several passages. ‘Va pensiero’ was magnificently performed in singing an invocation of great tragedy, but also capturing the valour and pride in their homeland, and it was a pleasure to witness this in a theatre intrenched so deep in the history and tradition of Italian opera. Of course the chorus was met by huge wave of applause so much so Ciampa asked them to repeat the chorus. An occasion to be seen and heard in Naples witnessing the Italian audience’s love for their music. The minor roles were all very well filled, especially the Fenella of Rossana Rinaldi, also the finely characterised Ismaele of Marco Miglietta, and Fulvia Mastrobuono as Anna, but ultimately it was the great chorus who were at the heart and soul of this performance, while the Abigaille of Susanna Branchini proved the singing sensation of this outstanding production. On this evening the San Carlo Theatre proved they are among the greatest opera companies in the world today.